A LL IN NICE CONDITION. ELASTICATED WAIST. Jaeger ladies two piece suit, size 12 In Red.. Condition is Used but is in great condition .Dispatched with Royal Mail 1st Class. Green with black shine. trousers waist size 30" /inside leg length 31". jacket armpit to armpit 19". trousers & jacket. There are a small fee moth marks here and there. Trousered are quite worn so really it’s the jacket that worth buying . Low start price of £1 to reflect the flaws Ladies Karen Millen Vintage Smart Pinstriped Trouser Suit Business Size 12. Condition is Used. Dispatched with Royal Mail 2nd Class. Really lovely suit fully lined jacket. 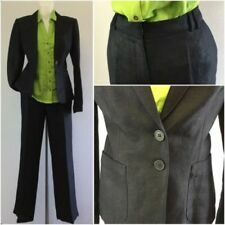 A beautiful LK Bennett size 12 lined black suit with both a skirt and a dress. Jacket is to waist with 4 small pleats at back. Pleats are also on skirt. Dress is a pencil dress. Length is mid calf. Straight pencil skirt with back zip and 4" vent to front centre - fully lined. Length = 24". Worn a handful of times, a gorgeous trousers suit by Planet . Both jacket and trousers are size 12. Linen and viscose mix, white with cream detailing and a removable pin.The trousers are fully lined and have a cream line running down the sides. Beautiful LK Bennett trouser suit. Jacket and trousers are lined. Lovely Jaeger tuxedo suit. Trouser waist - 39cm. Wirral Hospice, St John's. I WORE THE JACKET TO A CHRISTENING BUT THE SKIRT WAS NEVER WORN. SKIRT IS SLIGHTLY LONGER AT ONE POINT WHICH IS 27". SKIRT WAIST IS 32". THERE IS A VERY SUBTLE THREAD OF EMBROIDERY WITH VERY DISCREET SEQUINS ON THE JACKET. Excellent detail on the jacket with big brown buttons. Buttons on the front of the trousers make it a "flat tummy" effect. The trousers are wide legs. Fastening by a zip on the left side. 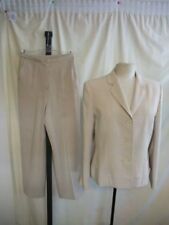 NEXT 2 piece beige suit with jacket and trousers. Condition i s used. T he re i s a sl ig ht s na g in t he l ef t ar m seepicture 4. It is made from Cupro and Polyester and is a high quality fabric in a good weight to ensure it always hangs well. Apologies for the pictures the suit dress is an exact match for the Jacket. Suit condition - Excellent - Has only been worn twice and has no marks, tears or holes. 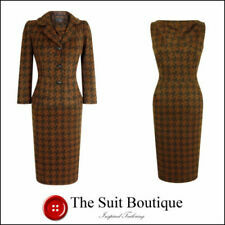 Planet Houndstooth Pattern Trouser Suit - UK Size 12. Condition is Used. Dispatched with Royal Mail 1st Class. Two piece suit in a black and white houndstooth pattern. Jacket is single breasted and fastens with two buttons. There is pocket detailing at the front (as shown in photos). At the ends of the full sleeves there is button detail also. Jacket is fully lined. Trousers are straight legged with front pleat. They are fully hemmed as well. There are pocket detail on the rear and actual pockets on the front. Trousers have a waist band with belt loops. Fastens with a hook and eye plus a visible button. Item has been worn but is in excellent condition. Item is machine washable and comes from a smoke free home. 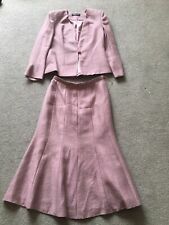 Coral Coloured Next Womens 2 Piece Suit (Skirt size 12, Jacket Size 10.). Dispatched with Royal Mail 1st Class. I HAVE PUT THIS JACKET WITH DRESS AS THEY GO SO WELL TOGETHER. THIS FLATTERING DRESS AND JACKET ARE VERY WELL MADE AND BEAUTIFULLY DESIGNED AND ARE IN VERY GOOD CONDITION. Trousers are size 12 - zip fasten - 2 small pockets on the front. Lovely stitching design around the waistband of the trousers and around the edge of the collar. Lovely ladies jigsaw suit in good condition. This is a fabulous quality trouser suit from M&S in a beautifully soft cream and fine grey pinstripe fabric. It really hangs nicely and there is a little stretch in the material, so the trousers are very flattering and comfortable. Made from viscose, this silver grey two piece blazer jacket and skirt combo would be ideal to wear to your next special occasion! The jacket has a collarless neckline, open front and matching skirt with side zip fastening. NEXT TROUSER SUIT. Jacket size 14, Trousers size 12 Long. Minor signs of wear only. Trousers size 12 Long, 33" inside leg as have been let down, waist 16", unlined. The Jacket has a large retro HOBBS stamped button to fasten, with 3 Hobbs stamped buttons on the cuffs of the long sleeves and is fully lined with H embellished lining. This is a UK 14. Trousers with lovely Jacket. Topshop vintage Wide leg, off White, Pinstrip Leg Trouser Suit Size 12 Long. gorgeous long wide leg trouser couple marks please see photos Condition is Used. Dispatched with Royal Mail 1st Class. The skirt is a very classic knee length pencil with a rear split and two zipped pockets. A very smart suit from Next. 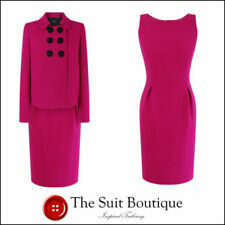 A very smart and stylist suit that is equally perfect for office or for a special occasion. Made from 98% wool and 2% elastane, this dark purple two piece blazer jacket and trouser combo would be ideal to wear to your next special occasion! The jacket has a collared neckline, two button fastening and matching trousers. 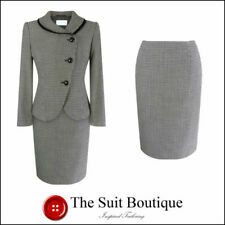 TM Lewin Ladies Andrea Jacket, Size 10 Charcoal And Size 12 Skirt. Worn once for an interview, although not the same collection they match perfectly. Woman's suit, size 14 Jacket has no tag, size 12 Skirt with with tag, Marks & Spencer, black and white small squares. Skirt and jacket. Black stitching detail. Beautiful design. Dispatched with Royal Mail 1st Class. BEAUTIFUL NEXT FINE TWEED EFFECT TAILORED TROUSER SUIT. Retro Blue Satin skirt Suit. Long Jacket/coat Size 14 and skirt Size 12. Retro Blue Satin skirt Suit. Long Jacket/coat Size 14 and skirt Size 12.. Condition is Used. Dispatched with Royal Mail 2nd Class. Fully lined skirt and belted sleeveless jacket with button detail. - Skirt: waist 40 cm, length 60 cm. - Jacket: length 58 cm, armpit to armpit 50 cm. The trousers are gold with a gorgeous floral pattern these are a bell bottom trouser which has a belt attached to them. The Jacket is cream with gorgeous gold pattern on the cuffs, pockets and the high neck collar, it is good quality and thick. JACKET 24" LONG SKIRT 34. NICE BEAUTIFUL FLOWER DECORATION. Condition is Used. The colour of the suit is Coral apologies for the piccies they do look pink. I am having a spring clean wardrobe clear out. The dress is long semi fitted with a straight skirt with side splits and fully lined. Louis Feraud Matching Jacket and Skirt Suit. Condition is Used. Dispatched with Royal Mail 2nd Class. Lovely Kasper for ASL black jacket and skirt with fine silver thread pinstripe and detachable white blouse lapel and turn up cuff. This suit is very nicely made and is lightweight. Excellent good clean condition.